Definition: The External Sources of Recruitment mean hiring people from outside the organization. In other words, seeking applicants from those who are external to the organization. Media Advertisement: The advertisement is the most common and preferred source of external recruiting. The ads in newspapers, professional journals, give a comprehensive detail about the organization, type, and nature of job position, skills required, qualification and experience expected, etc. This helps an individual to self-evaluate himself against the job requirements and apply for the jobs which best suits him. Employment Exchange: The employment exchange is the office run by the government wherein the details about the job seekers such as name, qualification, experience, etc. is stored and is given to the employers who are searching for men for their organizations. For certain job vacancies, it is mandatory for every organization to provide details about it to the employment exchange. It is the most common source of external recruitment that offers jobs to unskilled, semi-skilled and skilled workers. 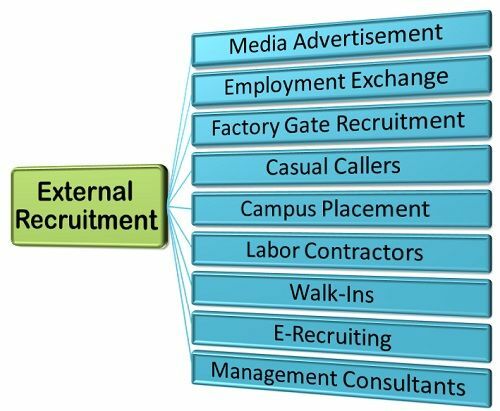 Direct Recruitment: The direct recruitment also called as factory gate recruitment is an important source of hiring, especially the unskilled workers or badli workers who are paid on a daily-wage basis. Here, the company puts up a notice on a notice board or on the factory gate regarding the jobs available, such that the applicant sees it and apply for the job directly. Casual Callers: The casual callers, also called as unsolicited applications are the job seekers who come to the well-renowned organizations casually and either mail or drop in their job applications seeking the job opportunity. This could be considered as an important source of external recruitment as the personnel department maintains the folder of unsolicited applications and call those who fulfill the job requirements, whenever the vacancy arises. Educational Institutions or Campus Placement: Creating a close liaison with the educational institutes for the recruitment of students with technical and professional qualifications has become a common practice of external recruitment. Here, the companies, visit the technical, management and professional colleges to recruit the students directly for the job positions. The recruitment from educational institutions is also termed as campus recruitment. Labor Contractors: This is the most common form of external recruitment wherein the labor contractors who are either employed with the firm or have an agreement to supply workers to the firm for the completion of a specific type of a task. This method is again used for hiring the unskilled and semi-skilled workers. The contractor keeps in touch with the workers and sends them to the places where their need arises. In doing so, the contractors get the commission for each worker supplied. Walk-Ins: This is again a direct form of recruitment wherein the prospective candidates are invited through an advertisement to come and apply for the job vacancy. Here, the specified date, venue, and time are mentioned, and the candidates are requested to come and give interviews directly without submitting their applications in advance. E-recruiting: The e-recruiting means searching and screening the prospective candidates electronically. There are several online job portals that enable the job seekers to upload their resume online which are then forwarded to the potential hirers. Such as naukri.com, monster.com, shine.com, etc. are some of the well renowned online job portals. Management Consultants: There are several private management firms that act as a middleman between the recruiter and the recruit. These firms help the organization to hire professional, technical and managerial personnel, and they specialize in recruiting middle level and top level executives. These firms maintain data of all the job seekers, such as education, qualification, experience, etc. and give their details to the companies who are looking for men. Nowadays, the engineers, accountants, lawyers help their counterparts to get suitable jobs in industrial organizations. These are some of the commonly used methods of external recruiting that companies select depending on the nature of the job position and the number and type of candidates to be reached out.